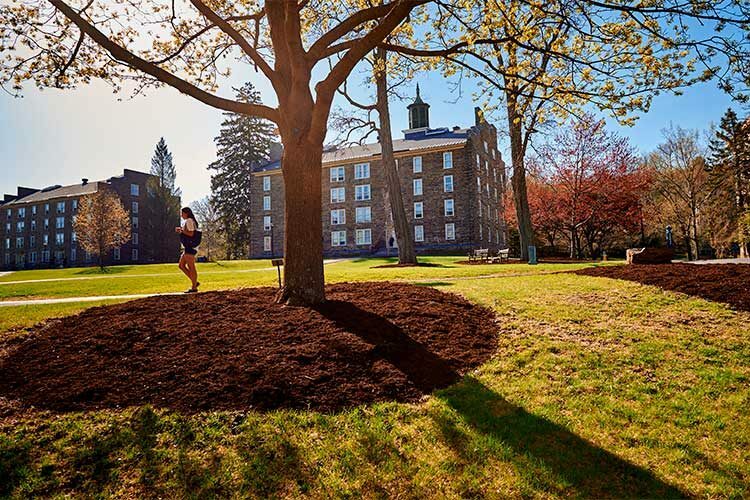 Today marks the first of 13 days of special events, lectures, discussions, films, and more to celebrate Colgate’s efforts toward becoming a more sustainable university and achieving carbon neutrality by 2019. The 13 Days of Green will begin with a kick-off event on the Academic Quad, Monday, April 10. Come help us celebrate spring while meeting members of Colgate organizations focused on sustainability and environmental issues. Activities range from listening to live music to planting seeds in reusable containers. Food and information about the rest of the 13 Days will be available — we can’t wait to see you there! Professor Cameron Brick from Hamilton College and Colgate’s Andy Pattison, Gretchen Hoadley Burke ’81 Endowed Chair in Regional Studies, will discuss psychology, policy, and everything in between during this ENST, psychology, and Upstate Institute pub-talk. Eager for Earth Day to arrive? No need to wait! Earth Day is coming early at the Broad Street Gallery. Come and engage in a creative earth-focused project and learn more about how art and the environment can connect. The Green Summit has been central to the mission of the 13 Days of Green, and provides a forum for discussing sustainability and environmental issues. In 2017, the 17th Green Summit will highlight community perspectives on sustainability. Madison Smith ’19, Carrie Blackmore ’08 (Owner, Good Nature Brewing) and Lateef Clark (Executive Chef, Chartwells) will each speak for 10–15 minutes before fielding questions. The event will be preceded by a small reception, and representatives from the Office of Sustainability will be available to facilitate discussion after the presenters speak. Attendees will also be able to enter into a special raffle for an ENO hammock. To wrap up the Green Summit, we will present Oak Awards to three members of the Colgate community who have made outstanding contributions to sustainability. In this environmental studies brown bag, Joshua Geller, professor of political science and public administration at the University of North Florida, will talk about how innovation can lead to environmental solutions. Join us for lunch and what’s sure to be a dynamic presentation. Come join the Office of Sustainability and refresh your wardrobe at our clothing swap on Saturday, April 15. If your closet’s gotten a little stale or doesn’t match your current style, you can drop off used clothing during the week before and receive a voucher to use on Saturday. This is a great opportunity to update your look while being sustainable. It is definitely going to save you time and money. Green Thumbs is hosting a Locavore Dinner at the Loj on April 15 and would love to see you there. Don’t know what a locavore is, or why it’s important? No problem! This dinner will focus on exploring local and sustainable food practices and how to eat more sustainably at Colgate. Of course, dinner will be provided. Join the Green Raider interns on Twitter to ask any and all questions you may have about Colgate sustainability. Follow and tweet at @ColgateSstnblty. Come join the Office of Sustainability for games, prizes, and the chance to win a gift basket containing an ENO hammock, a Nalgene, and more! Need an excuse to take a break from studying and watch a movie? Want a picture with a Leonardo DiCaprio fathead? Join the Office of Sustainability in a screening of Leonardo DiCaprio’s award-winning documentary, Before the Flood. This film explores the current state of the controversy over climate change and explores possible adaptation pathways moving forward. Refreshments will be provided. In this environmental studies brown bag, Andrew Pattison, Gretchen Hoadley Burke ’81 Endowed Chair in Regional Studies, will host Chris Rossi (Town of Hamilton), Scott Ingmire (Madison County), and Jamie Hart (Madison County) for a panel discussion addressing local sustainability and climate action planning. Lunch will be provided by Hamilton Whole Foods. Join the Office of Sustainability, the Spring Party Weekend Committee, and the Class Leadership Council to celebrate Earth Day and spring with a zero-waste meal and good company.